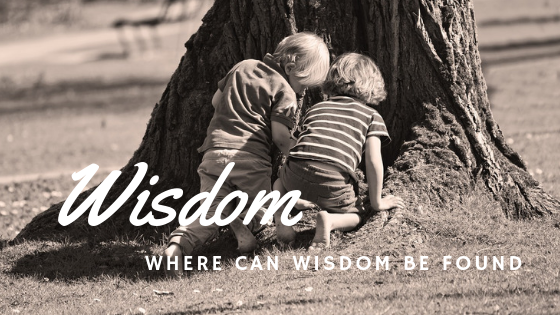 Developing Wisdom – Where Can Wisdom be Found? If Job is right, we may see elements of wisdom in the writings of the wise, gain increased perspective from a variety of experiences, people, cultures and study, but wisdom will not be found in the world around us. What is more, Job believes we underestimate its core value. I’ve never been a miner searching for gold or diamonds, but I have had my share of swinging a hammer to chisel against “flinty rock”. In one of my not-so-wise moments, I decided to make a flagstone path between one farm house and another in our yard. My Dad showed me the proper tools and technique. Now it was up to me to search the rock piles on our farm and beyond to find the right rock, the flinty rock, that would yield to the not-so-subtle persuasion of hammer and chisel. It took persisting through summer’s heat, enduring back-breaking labour to split, haul and set each stone. All for flinty rock! I did it though — for the sake of a path! This is an unworthy comparison to the efforts taken to uncover “precious” metals and gemstones. Am I willing to make such effort for wisdom? Will I seek wisdom with similar determination? If I value wisdom, I will! If I don’t correctly assess the true value and benefit of wisdom, I will give up before finding it. Why should one make the effort? Job throws in a bonus giving us both the “where” and the “how” of wisdom’s source. Is there an easier way? Another way? Any other way? Isn’t “fear of the Lord” outdated — archaic? James acknowledges there is, in fact, a kind of “wisdom” to be gained now from the things around us. He warns that such “earthly wisdom” will eventually produce the unexpected results of bitter envy, selfish ambition, disorder and every evil practice. We don’t have to look far to see ample evidence of this principle at work. He, too, points our vision upward to the ultimate Source of all wisdom. This is wisdom worth taking hammer and chisel too, worth pursuing with all diligence and effort, worth seeking and holding on to at all cost. Don’t you agree? But How do You Gain Wisdom? Splitting flinty rock won’t expose the greatest treasure available. Wisdom is discovered, granted and given to all those who are willing to pursue the vastness, beauty, magnificence and wisdom within the invisible God, made visible through Christ. Through a vibrant relationship with Wisdom, and here alone, does one become wise. The people who now walk that little garden path will never know the hours of labour it took to transform flinty rock into usefulness. Thousands of steps have skipped, jumped and hopped along that little winding trail. In the same way, as one looks to only earthly sources for wisdom, one is tempted to skip, jump and hop from one good read, piece of advice, speaker, preacher and scholar to another without truly gaining the depth of wisdom and understanding available. Fortunately, many people seek wisdom; unfortunately most people search in an array of earthly and psychic realms. Let us confidently and boldly ask for wisdom to saturate our lives, resting in His Presence, seeking His face, knowing Him more, and somehow moment by moment becoming more like Him in wisdom. Loved it! The theme this year at school is wisdom. This is a keeper to reflect upon.